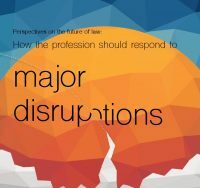 This article will give some insights into these disruptors and suggest how members of the legal profession can respond to them. To start, a brief discussion about the term “non-lawyer” is helpful. Lawyers seem to like this word and we readily use it, in particular, in any instance when we are talking about someone who is not a lawyer (including paralegals, who are also licensees of the Law Society of Ontario). The members of other professions don’t seem to have the same hang-up. Do you ever recall hearing a dentist refer to non-dentists, or a doctor referring to non-doctors? Most people, including lawyers, are familiar with and regularly use terms such as dental hygienist, nurse practitioner, chiropractor, physiotherapist, etc. When lawyers use non-lawyer there can be a subtle suggestion that we have special status or are in some way superior to non-lawyers. This is more likely to be perceived negatively when lawyers put forth the proposition that the monopoly we have on legal services is special and should be protected. In recognition of the negative context the term non-lawyer can sometimes create, at a conference I recently attended we all agreed that we would refer to individuals that were not called to the bar as “human beings.” Now to be sure, lawyers have a good life relative to many human beings. And while many of us don’t quite earn what the human beings think we do, most of us have a fairly decent income and enjoy the work we do on a day-to-day basis. We should not take this for granted, and we should avoid giving human beings the impression we are somehow better than they are. Referring to non-lawyers as human beings worked nicely at the conference, and I will do the same in this article. Unfortunately human beings is not practical as a substitution for non-lawyer in everyday conversation. In recent years, access to justice (A2J) issues have been getting increasingly more attention. The most obvious A2J issue is a court system that is bogged down with large numbers of self-represented human beings, in particular in the family law area. Human beings with poverty law issues often can’t find or afford help and most would acknowledge that it is financially challenging for middle class human beings to hire a lawyer. So clearly, there are lots of human beings not getting the legal they need. In contrast, there is lots of work being done by lawyers. By one estimate, Canadian law firms will earn $25 billion in revenue in 2017. This stark contrast is explained in a survey that concluded that Canadians get help from lawyers on only 11.7 per cent of their justiciable events. To be fair, some of these human beings may not want help with their issue. Others could be dealing with a small or insignificant issue for which they don’t need formal legal help or can solve themselves with a DIY solution. Still others may not recognize they have a legal issue or have access to a resource that could help them identify and find help for it. However, there remains a significant number of human beings who need and want help, but can’t get it for a variety of reasons, including not being able to afford it or being unable to find someone to help them. And U.S. Census Bureau statistics seem to indicate the problem is getting worse: while total law firm receipts increased from $225 billion in 2007 to $246 billion in 2012, receipts for work done for individuals declined 10.2 per cent over the same time period, a staggering sum of $7 billion dollars. Lawyers tend to focus on preserving and protecting the small 11.7 per cent portion of the legal services pie we are already serving. It is incumbent on lawyers to pay more attention to the unserved 88.3 per cent as others are stepping up to the plate to provide services to this group. Recognizing the dire need in the courts, the Ministry of the Attorney General and the Law Society of Ontario are exploring whether paralegals or special limited licence providers can give some forms of assistance to human beings with family law issues. Various alternative legal service providers (see below) are also looking for ways to meet the legal needs of this group of unserved clients. In various subtle and not so subtle ways, clients are driving change as well. Clients in most areas of practice are asking their lawyers to provide more for less. They want more and better service, and at the same time, lower fees. Some clients will call around asking for quotes in an effort to find the lowest price. This is putting significant pressure on lawyers to lower their fees. While quoting the lowest fee may make sense to get a client in the short term, it may not bode well for running a profitable practice in the long term, unless steps are taken to do it more effectively and efficiently (see below). Millennials come to the table with a set of expectations that are very different from most traditional law firm clients. They are tech savvy and very comfortable buying things online. They like using the internet to find information and solutions to their problems quickly and expect to be able to do so 24 hours a day. I recently spoke to a millennial, a lawyer herself, who was very frustrated because two lawyers she had approached to do a will were unwilling to meet her and her husband outside of office hours. As compared to the individual clients of solo and small firms, corporate clients are often more sophisticated and have larger budgets to pay for help on a wide variety of matter types. Still, they too, are putting pressure on law firms for lower fees and many are pushing law firms to consider flat fees and other alternative fee arrangements. As evidenced by increasing numbers, corporate counsel are doing more work in-house. U.S. Bureau of Labor statistics show that the number of in-house lawyers tripled between 1997 and 2016, as compared to just 46 per cent more government lawyers and only 27 per cent more lawyers at private law firms over the same time period. (cloc.org). The members of this fast-growing organization are the legal operations employees of Fortune 500, medium and small companies, government entities and educational institutions. Legal ops usually have a financial background and look for ways to lower costs and optimize the delivery of legal services to a business. Through conferences and networking, the members of CLOC share resources and teach each other how to get the legal help they need more effectively, efficiently and at a lower cost. CLOC is driving significant and rapid change in how legal services are consumed by corporate clients. In-house counsel are also making far greater use of legal process outsourcing (see below). Technology is another major disruptor that is driving huge change in the legal services arena. Changes brought about by the fax machine and email – which were seen by many as earth-shattering when they occurred – seem small and insignificant relative to emerging technologies on the horizon. Technology has significantly changed the manner in which work is done in a law office, as well as the manner in which lawyers communicate with and serve their clients. With the advent of networked computers and email, many law offices are operating in a much more digital fashion with far less paper. Email has become the de facto mode of communication between lawyers and clients. Smart phones allow clients to access their lawyers around the clock. And while it was unthinkable just five years ago, many law firms are using cloud-based services and storing sensitive client and firm data in the cloud. By some accounts, increasingly smart computers will replace lawyers. But how much of this is hype and how much is reality? This is discussed in more detail in the “Artificial intelligence: What is AI and will it really replace lawyers?” article in this issue. Various internet-based technologies have opened the door for individuals and entities, many of whom are not lawyers or law firms, to offer online legal services or help with selected tasks that are a constituent part of handling a matter. These “alternative legal services providers” are discussed in the next section. Blockchain will also bring significant change. It is the technology behind bitcoin and other cryptocurrencies. See “What is blockchain?”. The blockchain above handled simple financial transactions. Blockchain systems can be built to handle more complex transactions. Sweden is building a blockchain-based land registry system. Blockchains can include smart contract functionality and can be used for complex commercial transactions involving multiple parties. For example, the seller, buyer, lender and shipper of goods could complete a commercial transaction entirely on a digital basis within a blockchain system, including verifying the identity of the parties, preparing and signing a bill of sale, applying for and advancing the loan, making and verifying payments, and instructing, tracking and paying for shipping. The appeal of blockchain is its ability to irrevocably verify and record every step in a transaction in a secure environment that is global and platform independent (it won’t matter what technology systems or software you use in your office). Lawyers can expect to see blockchain systems become part of some of the transactions they handle today, and in some instances, lawyers may find themselves replaced as transactions will be completed entirely within a blockchain system. There are Canadian law firms currently building blockchain systems to better serve their clients. Lawyers should wake up to the fact that various alternative legal service providers are actively looking to address the legal needs of the clients their firms are currently serving as well as the human beings they aren’t currently serving. These alternative legal service providers come in many forms. They include websites that sell legal forms, legal process outsourcers, and apps or websites that dispense legal information or advice. Many lawyers were quite upset when DIY forms books appeared on the shelves of bookstores 25 years ago. Most of these books had simple “fill in the blank” forms in them. The forms that first appeared online were also simple fill in the blank forms. As compared to the advanced forms found online today, these old fill in the blank forms were prehistoric stone tablets. Legal process outsourcing (LPO) refers to the practice of obtaining support services from an outside law firm or legal support services company (LPO provider). When the LPO provider is based in the same country, the practice is called onshoring. When the LPO provider is based in another country, the practice is called offshoring. In the early days of LPO’s, law firms tended to outsource back-office functions like bookkeeping, accounts receivable collections, etc. Globally LPO has become a multi billion dollar industry. Major LPO providers like Axiom, Integreon Managed Solutions, Inc., and Pangea3 (owned by Thomson Reuters) are global companies that have operations in multiple countries. In Europe and the United States it has become very common for corporate entities and, more recently, law firms to outsource legal work, including agency work, document review, due diligence, legal research and writing, drafting of pleadings and other litigation support, contract management, and patent and other IP services. Major accounting firms are also doing LPO work (e.g., document review). 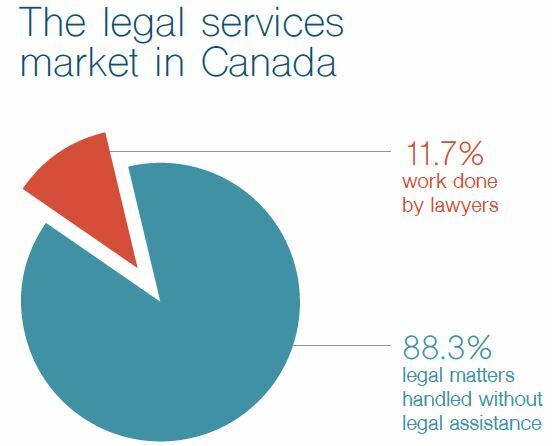 A 2016 survey of almost 250 lawyers across Canada, including those who worked in firms, corporations and the government, found that 40 per cent were using legal process outsourcing. It is virtually impossible to know how many forms sites, LPO providers and other alternative legal service providers there actually are. But a good starting point is the Legal Tech Startups list on LawSitesBlog.com. It is the most complete and up-to-date list I have come across. As I write this article there are 691 startups listed. While some of the companies listed are arguably not startups anymore as they have a large base of existing customers, the majority of companies on the list are in the early stages of creating or testing a new product or service aimed at the legal services arena. Some of the startups on this list have received large investments from leading venture capital firms and technology companies (e.g., Google has invested in LegalZoom and Rocket Lawyer). Established legal industry vendors and LPOs are also investing in these start-ups (e.g., Lexis-Nexis acquired Lex Machina) to offer new services and products and to obtain technology to improve their existing products (e.g., Integreon acquired Allegory). While some of these startups are clearly aimed at helping lawyers work better, faster, or cheaper many offer various types of legal assistance directly to consumer or business clients. In some cases those clients are currently being served by lawyers; in other cases those clients are getting little or no help from lawyers. The sheer number of startups on the LawSitesBlog list is striking, not to mention the fact that the venture capital firms investing in them must see significant potential revenues here. These startups will bring meaningful change to the legal services business. Take a look through the LawSitesBlog list to gain an appreciation of the types and variety of legal services that these entrepreneurial and innovative startups are providing to human beings and entities that are looking for help with legal issues. How does the legal profession respond to alternative legal services providers? 3. bring them into the legal services tent. When it comes to dealing with a human being providing legal services, the first inclination of most lawyers is that the human being be prosecuted for the unauthorized practice of law (UPL). This is not necessarily a practical option for several reasons. First, there is the challenge of determining whether the startup is engaged in the practice of law. Is a company that owns a website that generates a will engaged in the practice of law? Does the answer change depending on whether it is a simple will with very basic clauses for an individual or a very complicated will that includes family trust provisions? Is a company that owns a web-based service that predicts litigation outcomes or gives strategy advice engaged in the practice of law? What about a company that solely does document review for eDiscovery or due diligence purposes? UPL prosecutions tend to be very time-consuming and expensive. Most legal regulators do not likely have the resources at present to launch large numbers of UPL prosecutions, and it’s probably safe to assume members of the profession are unwilling to pay significantly higher annual dues to give their regulators the resources to do so. It’s also important to keep in mind that UPL prosecutions are not intended to protect lawyers’ turf; rather they are intended to protect the public from suffering damages due to incompetent legal services. Last but not least, human beings see UPL prosecutions as self-serving and protectionist, and alternative legal services providers helping individuals that were otherwise not getting help from lawyers and paralegals would likely argue that access to justice is being thwarted. In some ways the second option is the status quo. As a profession we are mostly ignoring alternative legal services providers. This option is easier and far less expensive than the UPL prosecution option, but it isn’t in the best interest of the legal consumer. Almost universally, the terms of service on alternative legal services provider websites state that the forms or services offered are not legal advice and are offered without warranty on an “as is” basis. The terms of service also specify that there are limitations to the liability of the provider, at best, a limitation to the cost of the service, and more typically, there is a provision that says there will be no liability whatsoever. Lawyers and paralegals may not like this option as it leaves the door open for the alternative legal services providers to encroach on the work that is currently done by lawyers and paralegals. To address the public protection shortcomings of the previous option we could consider bringing the alternative legal services providers into the regulatory tent. As the current regulatory regime operates by licensing individuals, this option might involve exploring some form of entity regulation. Another option would be to bring in selected types of services based on an assessment of where client protection or other regulatory needs are important or necessary. Client protection would likely be less of a concern when dealing with a parking ticket but a greater concern where a will was being drafted. Some providers may like pursuing this option as they will feel falling under the regulatory umbrella will give them more credibility with consumers. Others, likely in larger numbers, perceive this will increase their costs and decrease their ability to provide access to justice. So there are various options for less regulation to consider and evaluate. How should lawyers respond to the changing practice climate? The disruptors reviewed in this article will bring significant change to the legal profession. Lawyers need to recognize that these disruptions are occurring and respond to the changes they will bring. Areas of practice will come and go, as they always have. Cannabis law has burst on the scene in just the past year or so. An aging population will likely mean more work in coming years in the wills, estates and elder law areas of practice. Clients are going to need help dealing with blockchain and other emerging technologies. But lawyers need to think beyond traditional areas and manners of practice. The access to justice problem is an issue members of the profession should actively work to address on our own and with the input and assistance of other stakeholders. It is unlikely there will be an increase in legal aid funding that would be sufficient to help a significant portion of the human beings with unmet legal needs. Offering pro bono services is a great way to give back or support a personal cause, and while it will help many, it’s also not a solution to the unmet legal needs problem. Lawyers should consider unbundling or limited scope retainers as there are opportunities to help large numbers of clients who can pay for help on a part of their matter (visit practicepro.ca/limitedscope for tools and resources to help you provide limited scope services), but unbundled services can only chip away at part of the unmet legal needs problem. In their recent book The Future of the Professions: How technology will transform the work of human experts,7 legal futurists Richard and Daniel Susskind see two distinct futures for most professions, including the legal profession. One future will see some continue to work in traditional ways. The other future – the one that will bring fundamental change – will see increasingly capable machines and alternative service providers aided by technology transform the way practical expertise is shared amongst members of society. 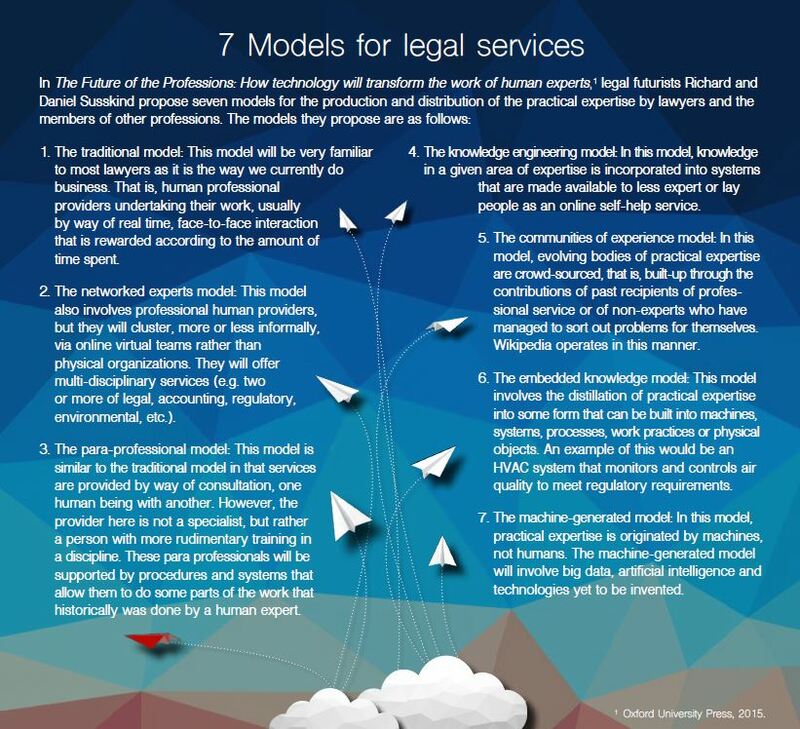 “The 7 models for legal services” below lists the various models the Susskinds’ predict for the future of legal and other professional services. Some of these models have already started to displace the work that is currently done in traditional ways by many professions. For now, these two futures will operate in parallel, but in the longer run – perhaps in two to three decades – the Susskinds see the second future as dominating and leading to a gradual dismantling of the legal and other professions as we know them today. The legal services monopoly is coming to an end. There will still be a market for Cadillac legal services at Cadillac prices. Lawyers that are seen as the top experts in a particular area will be sought after. Clients with “bet the farm” issues will also be willing to pay for help with little or no consideration of cost. Traditional practice will continue for this group of lawyers, but this segment of the market is very small, and will likely shrink. As time goes on, lawyers serving the rest of the legal market are more likely to find themselves competing with each other and alternative legal services providers, especially on lower value commodity-type services. They will have two choices – competing on service or competing on price. To compete on service, lawyers will have to provide superior service and also educate clients on the benefits of that superior service. A client that understands the benefits will likely be willing to pay more for those services. In the shorter term, this can be done one matter at a time. For years a real estate lawyer I knew refused to lower his fees when potential clients called him for a fee quote. He quoted fees that were typically $150-$250 more than what other lawyers had quoted them. He said to clients “I’m sorry, I can’t do the work I need to do properly to complete your deal for a fee that is that low.” By his estimate, clients stayed with him about two-thirds of the time. He also felt the clients he was getting were more appreciative of the work he was doing and less likely to be unhappy later on, even if minor issues came up. But the bigger pay-off is in the longer term where competing on service means building an ongoing relationship with the client. This involves thinking beyond quickly preparing articles of incorporation for a minimal fee. Spend time with the client to learn more about the client’s future plans. Highlight information and issues that the client should consider, and in particular, any steps the client could proactively take to be in a better position or avoid problems. For the incorporation example just mentioned, this means setting a goal of becoming the lawyer for a growing and prosperous business that will need help with other legal issues in coming years. This applies to a one-on-one lawyer-client relationship and at the firm level for a larger client. Competing on price means going toe-to-toe with law firms and alternative legal service providers that are offering services at cut-rate fees. There will be little to differentiate the service offerings here. This will be low-margin commodity work, most likely produced with the assistance of technology. To compete on price you will need to look at implementing process improvements so you are as efficient as possible. This will mean delegating or outsourcing work to get it done at a lower cost and using technology to automate parts of the process (e.g., web-based client intake, document automation to create documents or offering online services). Lawyers and law firms have traditionally been slow to adopt new technologies. A general technology competence requirement appears in the ethics rules of only 26 U.S. states. Many alternative legal services providers have embraced technology and lawyers and law firms will need to do the same if they hope to compete. You don’t need to learn to code, but you do need to understand how technology can be used to work more efficiently and effectively. Last, but not least, lawyers should not forget the potential clients that we are not currently serving. Many of the alternative legal services providers are looking for ways to help these unserved clients and lawyers need to do the same. It goes without saying that the traditional model of practice doesn’t work for this group, mainly due to affordability. While unbundling opens the door to some of the unserved group to get help on parts of their matters, new practice models using technology have greater potential to help this group. If you want a clear picture of where we are going, read The Future of the Professions: How technology will transform the work of human experts by Richard Susskind and Daniel Susskind. Nothing else I have read more clearly and convincingly elucidates the future of legal services and how technology will transform the traditional practice of law. The Canadian economy, and the law firms within it, were isolated from the fallout of the 2008 financial crisis. Law firms of all sizes in the U.S. and U.K. saw a significant drop in the demand for their services and the start of a transition to a world where clients started demanding lower fees. The Canadian ecosystem has been fairly isolated from changes elsewhere in the world, but these changes are starting to happen here. Legal forms are available online. In-house counsel are learning from foreign colleagues and participating in organizations like CLOC. As these changes have picked up momentum elsewhere, they may well happen more rapidly in Canada. The biggest challenge most law firms face is a business model that doesn’t fit the changing manner in which legal services are being provided today. Virtually every recent innovation in the legal services market – automation, process improvement, multi sourcing and web-based services – has operated to reduce the amount of time and effort required to produce and deliver legal services. In contrast, most law firms price work, bill clients, compensate lawyers and reward partners based on the amount of time and effort required to produce and deliver legal services. At many firms the barriers to change are significant when the personal experience and comfort zones of most lawyers are coupled with firm culture and incentives. To help bring meaningful change to your firm you should develop a strategy. Richard Susskind’s Guide to Strategy for Lawyers, published by the CBA Legal Futures Initiative, provides a general step-by-step guide that lawyers and law firms in all practice settings can use to start to create a strategic plan that will help them implement changes to successfully adapt to the changes that will occur in coming years. The “Further reading” sidebar contains other books that you may find helpful. The “Future of law news and developments” below lists people and organizations who publish regular updates on Twitter and their blogs. See “Ideas for rethinking your law practice” for more that you can do. Bill Gates once said that we always overestimate the change that will happen in two years, and underestimate the change that will happen in 10 years. While the legal profession probably won’t look that different two years out, in all likelihood it will be radically different in 10 years, in ways most of us can’t see or imagine. The profession needs to rise to the challenge and find the opportunities these changes will bring. Dan Pinnington is Vice-President, Claims Prevention and Stakeholder Relations at LAWPRO. can arise from lawyers choosing to adapt to change. Law Is A Buyer’s Market: Building A Client-First Law Firm by Jordan Furlong. Self-published, 2017. Great insights into how clients think about legal services and how law firms should respond. Legal Evolution blog by Prof. Bill Henderson. 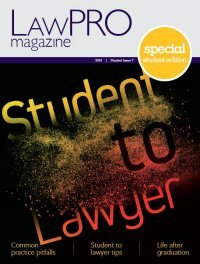 Thought provoking articles on the future of law and legal education. The Innovator’s Dilemma: When New Technologies Cause Great Firms to Fail (Management of Innovation and Change), by Clayton Christensen. Harvard Business Review Press, 1997. Lots of lessons for the legal profession in this classic book that explains why most companies miss out on new waves of innovation. The American Bar Association’s Law Practice Division has dozens of excellent books on legal technology generally as well as books on specific products. They have published many other books on other law practice management topics (finances, marketing and management). Many of these books are available for loan to Ontario lawyers from the practicePRO Lending Library (practicepro.ca/library). Rules for a Flat World: Why Humans Invented Law and How to Reinvent It for a Complex Global Economy by Gillian Hadfield. Oxford University Press, 2016. Perspectives on why our legal institutions are out of step in a digital world and what we should do about it. @CFCJ_FCJC: New on A2J issues from The Canadian Forum on Civil Justice, a national nonprofit dedicated to access to justice research and advocacy. @cloc_org: News and information from the Corporate Legal Operations Consortium. @Jordan_law21: Legal futurist Jordan Furlong provides commentary on a changing profession. @legalfutures: News and information on what’s happening in the U.K.
@LeanLawStrategy: Current news and thought provoking comments and insights from legal strategist and innovator Kenneth A. Grady. @legalmosaic: Thought provoking articles from legal industry strategy consultant Mark A Cohen. @RyersonLIZ: The Legal Innovation Zone is a legal tech incubator run out of Ryerson university. @ronfreidman: Consultant Ron Friedman comments on the future of law, knowledge management, legal technology, better process and firm business models. @tagactiongroup: News on A2J in Ontario from TAG-The Action Group on Access to Justice, a working group of justice system stakeholders. @wihender: Prof. Bill Henderson from Indiana University Maurer School of Law provides insightful comments on the future of law and legal education.